Over the last month, FoodCoin kept collaborating with Innovations TV. 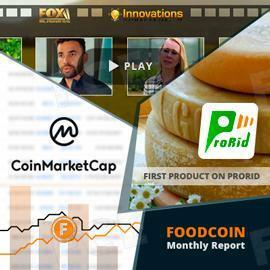 At the beginning of August, FOX Business channel released a 6-minute video featuring FoodCoin Team. The video is also available online, and it can be watched on FoodCoin YouTube channel. Foodcoin got listed on CoinMarketCap - the largest information resource about cryptocurrencies and exchanges. FOOD profile page contains all the actual information about the token: trade volume, total supply, exchange listings. As you know, PRORID is ready to use, and first product data has already become available for tracking. This product is the Swiss cheese made in Sennereigenossenschaft Obergedteln by FOODCOIN partners, the president of the cooperative Mr. Hubi Jost and dairyman Dietmar Benedetti. In August, 22, FoodCoin Team took part on 2nd Digital Meet and Greet Event which took place in Zurich, Switzerland. The founder of the project, Gregory Arzumanian, was a key speaker on the event. He presented to the audience features of FoodCoin and its partners. The presentation made a good impression. FOODCOIN appeared as tangible, really useful project with ready-made products. FoodCoin Team prepared first presentation about the concept of FOODCOIN ECOSYSTEM and the features of its blockchain. It presents FoodCoin blockchain as a basis for other tools of the ecosystem, featuring its concept, how double protections principle, and the systems of Verificators and Guarantors. - Wallet in FoodCoin blockchain network. •	Added data verifier work mechanism. •	Improved PRORID and metadata system. - Created an improved Wallok prototype. •	PRORID system follow-up improvement. - Follow-up improvement of smart contracts of product tracking system.